Forget sending flowers! Send Filet Mignon to roast over an open fire. 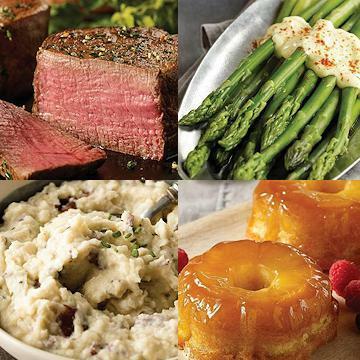 The steak that made us famous is the star of our favorite collection of gourmet items. Our incredible Smashed Red Potatoes, Pineapple Upside Down Cake and more round out this gift-ready combo or fantastic feast for two. Do Not Thaw. MICROWAVE (1100-WATT): Remove wrapping. Microwave on high for 8 minutes. Stir potatoes. Return to microwave and cook for an additional 2 minutes. OVEN: Preheat oven to 350�F. Remove wrapping. Cover potatoes tray with foil and place on a baking sheet. Heat for 30 minutes. Remove foil and stir potatoes. Continue heating for an additional 30 minutes. Microwave: Cut slit in center of film. Place tray in microwave; cook on high for 3-4 minutes or until internal temperature reaches 165�F. Carefully remove film and serve. Oven: Preheat oven to 350�F. Carefully remove film from tray before baking. Place tray on baking sheet on oven center rack. Bake for 35 minutes or until internal temperature reaches 165�F. Remove from oven and serve. Microwave: Remove cake from box and plastic film. Place cake right side up in its cup on a microwave safe plate. Microwave on high for 55 seconds. Immediately invert cake on serving plate. Release cake (without removing it from cup) by applying pressure to the bottom of the cup with thumbs while gently pulling up on the edges. Let stand for 3-5 minutes before removing cup and serving. Oven: Preheat oven to 350� F. Remove cakes from box and plastic film. Place cake right side up in their cups on a baking sheet. Bake for 14-15 minutes. Immediately invert cakes on serving plate. Release cakes (without removing them from their cups) by applying pressure to the bottom of the cups with thumbs while gently pulling up on the edges. Let stand covered by the cup for 3-5 minutes before removing cup and serving. Ingredients: Potatoes, Water, Sour Cream (Cultured Pasteurized Light Cream, Non Fat Milk, And Enzymes), Garlic, Butter (Pasteurized Cream), Half & Half (Milk, Cream), Sea Salt, Soybean Oil, Rosemary. Contains: Milk. Produced In A Facility That Also Processes Wheat And Egg Ingredients.